These days never get dull! Today we voyaged to Tagbilaran City, the capital of Bohol. After an hour and half drive winding through the island highway, we made it to the Provincial Planning and Development Office (PPDO). As always, we were greeted by kind hosts, who offered us coffee and Skyline crackers, the Philippines version of saltines. For the next hour, we gobbled up useful tidbit after useful tidbit of information from a room of PPDO officials (and also some tasty crackers). We were impressed with the information that they were able to provide us, including groundwater table data, soil data, water expenditure data, and elevation tables. Just as we began delving into legal requirements of a water project, Concepcion stood up and said we had to rush off to a meeting at the University of Bohol. After 10 rushed, confusing minutes, half of the project team agreed to continue meeting with the PPDO, as Ben, Kim, Concepcion, Joel (Natalie’s dad), Romulo (the local engineer), and I hurried off to the University of Bohol. Ben and I loved the school so much we wanted to transfer from UD to UB. 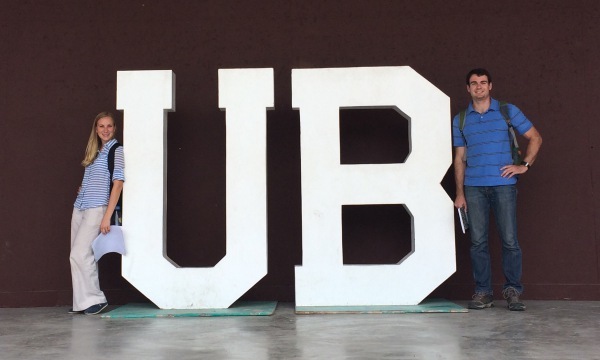 After an informative meeting with the head of the university, we were leaving and couldn’t help but take a picture with our new school’s letters! The two groups met up after these meetings for a yummy lunch and a meeting at the Department of Health - Provincial Health Office. They were able to provide past information on water quality in Ubujan and will help us with bacterial tests in the future. The ride back to Ubujan that followed was another hour and a half, this time filled with laughter and jokes as another exhausting, yet productive day, came to an end. The project team was tired, yet our ever hospitable host, Concepcion, was running around all day and night making sure everything ran smoothly. We are forever grateful for all of her support and advice in this program. It would not be possible without her. P.S. This is my self-proclaimed nickname after I got the sidekick seat in our van the first day in Bohol. Ironically I have not sat in it since, but the name stuck.